Why Do We Use Dogs For Search and Rescue? It has been documented that under ideal conditions, one well trained air scenting dog team can be effective as 50 – 100 ground searchers. How Do I Know If A Dog Is A Working Search Dog? Search dogs wear orange safety vests so they can be seen easily. Some dogs wear a bell so the handler can hear the dog and know where the dog is searching. At night, each dog wears a lighted collar so the dog can be seen. How Do Search Dogs Smell a Lost Person? A dog’s sense of smell is millions of times better than a person’s sense of smell. Humans shed skin cells that contain scent at a rate of 40,000 per minute – whether the person is alive or dead, buried or underwater. The scent travels on air currents from the human outward in the shape of a cone. The dog uses the air currents to pick up the scent and follow it to the source – the person. The job of the search and rescue dogs is to find the lost person as quickly as possible or to determine that the person is not in the area being searched. What does the handler do? The handler is given an assignment to search a specific area marked on a map. The handler uses their map and a compass to navigate through the area. The handler’s job is to make sure the dog has the best chance to find the lost person. The handler must use her knowledge of air currents, scent theory, weather and terrain to plan her strategy and maximize the use of the dog. What Happens Once The Dog Finds The Missing Person? Because the dogs all work off-leash, once they find the missing person, they have to go tell the handler. This is called an alert. Some alerts involve running up to the handler and jumping up on them, or barking at them, or pulling on a toy hanging off the handler’s belt. The handler then has the dog show them where the missing person is. Other dogs alert by staying at the missing person’s side and barking there, to bring the handler in to the missing person that way. Once the handler gets to a subject, an assessment is done to determine the subject’s medical status, and the information is radioed in to Base. The subject is retrieved from the woods in whatever manner is most prudent for the situation. Why Does The Dog Do It? Using positive reinforcement, we train our dogs to use their natural abilities – their scenting ability, their play and prey drives – to accomplish our goal of finding missing people. They comply for a number of reasons: their need to be with their handler and please them, for the reward at the end, as well as for the fun of satisfying their prey drive. While their ancestors may have ended a hunt with a kill, our dogs end it with a lot of enthusiastic praise and a good round of toy tugging or a game of fetch. What is the difference between an air-scenting dog and a tracking dog? Seek out generic human scent in the wind and follow it to the source (the missing person). Search without needing a scent article. Are able to search areas that have already been searched. Work off leash and cover large areas. Are able to search for a missing person long after the trail is cold. Are scent discriminating – seek scent of a specific person. Perform best with fresh track, little contamination. May determine direction of travel of the missing person. What should I do if I get lost in the woods? Here are the 9 Rules for Survival from The Lost In The Woods program. 1. Stay Together; DO NOT separate if you are with a friend or a pet. 2. Stay in one place or area. DO NOT WANDER! 4. Find a cozy waiting place, not a hiding place. 5. Put out something bright so searchers can see it. 6. Look bigger for searchers. 7. Do not lie on the bare ground. 8. Do not eat anything you are not sure of. 9. Stay away from large rivers and lakes. SAR is an acronym which stands for Search And Rescue. We will use the term SAR and the phrase “Search and Rescue” interchangeably. There is no difference in meaning. What kind of dogs are good for SAR? Search dogs usually come from herding breeds (German Shepherd Dogs, Border Collies, et cet) and working dog stock (Labs, Goldens, Dobermans, Rottweillers, et cet). Our k-9s run the range from a variety of pure breeds to mutts, in a variety of sizes. The important thing is that they have a high play drive, a high prey drive, good endurance, a strong desire to please their handler, and a high intelligence. SAR dogs also need to be non-aggressive to people and to other dogs. 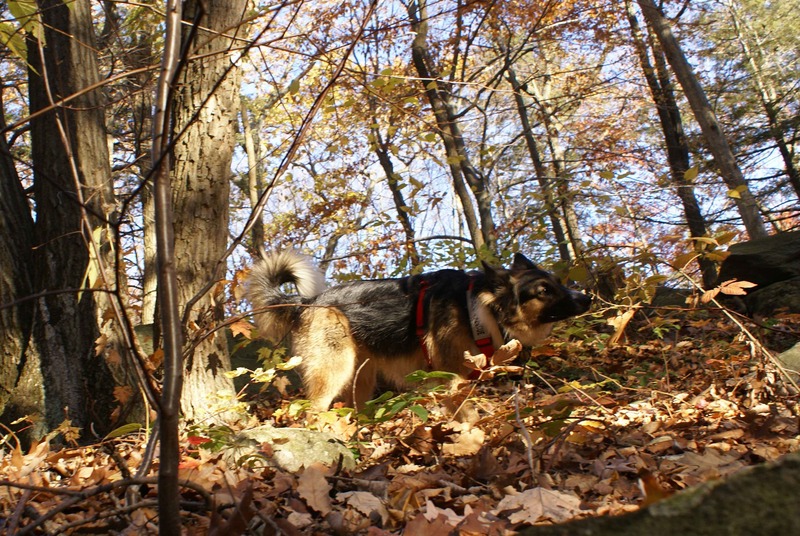 When should I start training my dog for SAR? If you already have a puppy or young dog and want to get it started in Search and Rescue, start training it now. Puppies can start learning fundamentals as early as 8 weeks of age. Check with your local trainer to find out about obedience and socialization classes. What are some good SAR related books? Scent and the Scenting Dog, by William “Bill” Syrotuck – scent theory and how to apply it in the field. Analysis of Lost Person Behavior, by William “Bill” Syrotuck – statistical analysis of past searches. Be Expert With Map & Compass – The Complete Orienteering Handbook, by Bjorn Hjellstrom – map and compass fundamentals. Search Dog Training, by Sandy Bryson – how to train a search dog. Ready to Serve, Ready to Save, by Susan Bulanda – strategies of real life SAR missions. Ready! The Training of the SAR Dog, by Susan Bulanda – another view on training. Search and Rescue Dogs: Training Methods, by American Rescue Dog Association – how to train a search dog. (Video) Search Dog Training – How to Get Started, air scenting training. (Video) Water Searching with Dogs – how to train dogs for water searches. How long does it take to train a dog for SAR? If the handler works regularly and consistently with the dog, it usually takes an average of 2 years to become fully certified. Because of the length of training time, we generally will not accept dogs over 3 years of age or so. A k-9 handler should expect to do formal obedience and socialization training with a qualified instructor, some “solo” obedience and simple exercises with his dog every day, a weeknight or 2 a week training with a buddy, and a weekend day every other week with the entire group. This is what every k-9 handler needs to do in order for their k-9 to progress and improve to the point where they are able to pass their certification tests. All handlers are required be become Field Assistants, so you will need to develop skills and take tests to reach that goal. Some of these skills we will help you learn, others you will be directed to learn through an outside agency (ARC First Aid, for example). In all cases, you are expected to be self-motivated in your training efforts. This job doesn’t pay anything in terms of money – we offer our services for free. In addition, you will not be reimbursed for time, training, equipment, or mileage, so this job will actually cost you money. That said, there is no monetary value you can place on knowing that you helped search for someone missing. Where does DAWGS search and train? We respond statewide in Connecticut and eastern New York to call outs 24×7. We also train statewide in Connecticut and in eastern New York, although occasionally we will train in Maine, New Hampshire or Massachusetts. Some training opportunities will present themselves out of state. It is the responsibility of the individual member to decide whether they are interested in attending, and whether they can afford it. Take a look at our info page. Read that page carefully as well as the one it links to. If you are still interested in applying, you can download the application and either email it back or USPS mail it to us. Many people find it informative to be a volunteer subject first. This involves coming to a scheduled training and sitting in the woods for a several hours while our k-9 teams come out and find you. It will give you an idea of what we do at trainings, and how we interact with each other. This is not required, but as I said, people seem to find it helpful. If you are interested in coming to a training as a subject, please email a request, and we will get back to you with some upcoming dates. What can I expect to happen once I apply? You read the answer to the “How do I join” question, just above this one. You read the required information, decide whether this is for you, and if you choose to move forward, download the application. You fill it out and send it back, either on paper or electronically. We vote on whether to accept the application based on the information you provided. If accepted, you will officially become an Applicant, and we will invite you to attend 3 months of trainings. This is a “getting to know you” time for both you and us. We will also evaluate your k-9 *. At the end of three months, we vote whether or not to extend Trainee status to you. If accepted, you will officially become a Trainee, and we begin training you and helping you train your k-9 *. You will have one year to complete your requisite trainings and become a Certified Field Assistant. All handlers must achieve Certified Field Assistant status. Your k-9 will continue to be evaluated to ensure that he is progressing *. * It is possible that your k-9 might not make it as a search dog. If we determine this is the case, it will not affect your status in the group – not everyone in the group is an active handler. Scrubbing a k-9 from the program is very difficult for everyone involved. The team will work with you to give your k-9 the best chance possible to succeed. A lot has to do with the training you put into it, but sometimes SAR work is not what your k-9 was meant to do. I bring this up now to make sure you understand that your continued participation in this group is no guarantee of your k-9’s continued participation. What kind of people get involved in DAWGS? DAWGS is made up of highly motivated people from a variety of backgrounds. We are white collar and blue collar – truck drivers, fire fighters, plumbers, researchers, administrators, and software engineers. What brings us together is the desire, and the need, to help. What are the annual dues for DAWGS? Our dues are very nominal, $40 per year. This helps offset our considerable expenses, and includes a membership into NASAR– the National Association for Search and Rescue. I don’t have a dog but I would like to help. Can I? Absolutely! While handlers and their dogs are obviously critical in a K-9 search group, Field Assistants are also an integral part of our group. Field assistants do map and compass work, radio work, and function as a second pair of eyes and ears for the handler. How can I start training now, before I apply? SAR teams require motivated people who are “self starters”. A good way of demonstrating thes critical attributes is by completing the following Trainee requirements before you apply, or at least starting on them. Since DAWGS gives you a finite amount of time to complete your required trainings, it makes sense to get a running start at them if possible. Here’s what available to you to start on prior to be accepted as a DAWGS Trainee. Buy and read these two books. Buy the book “Be Expert with Map and Compass” by Bjorn Hjellstrom, and buy an orienteering compass. Try to get one with a flat transparent base plate (it helps with plotting courses), and that shows at least every other degree. Read the book and start training yourself to navigate using the exercises in the book. Have current certifications in Adult CPR and 1st Aid. Have current certification in Pet 1st Aid. If you are planning on coming into the group with a dog you already own, the dog needs to be AKC Cainie Good Citizen (CGC) certified.